Ex Soldiers, Sailors and Airmen Association. 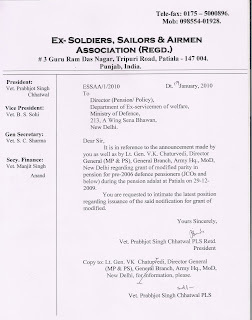 : Letter to Director (Pension/ Policy), S. Harbans Singh: Vet. Prabhjot Singh Chhatwal PLS Retd. Letter to Director (Pension/ Policy), S. Harbans Singh: Vet. Prabhjot Singh Chhatwal PLS Retd. Association,# 3- Guru Ram Dass Nagar, Patiala.